Users’ desire to access their content from anywhere and the Proliferation of smart phones, tablets and game boxes like Xbox, PS3 in modern homes and has created a new market category of Personal Cloud solutions. Various research reports from leading research firms predict that the next decade will be an era of Personal Clouds and forecast the active accounts associated with personal cloud storage services will exceed 1 billion at the end of 2013. We (Tonido, FileCloud) are one of the early proponent of Personal Cloud and self hosted cloud concept. Now we can confidently say our Personal Cloud server, mobile apps, sync and drive clients can give serious competition to popular public cloud compatriots in terms of functionality, UX, Performance and value. You don’t have to take our word for it. Do your own research. Check our mobile apps rating in the respective app stores, Read independent media reviews or check out user reviews of Tonido in popular news forums or just try the Tonido software by downloading from here. But when you compete with multi-billion dollar behemoths like Google or Dropbox for a market share , it is imperative to change the narrative to objectivity and bring quantitative numbers to the table.If we are going to compete in terms of perception, it is a lost case and we don’t have the resources to pull it off. 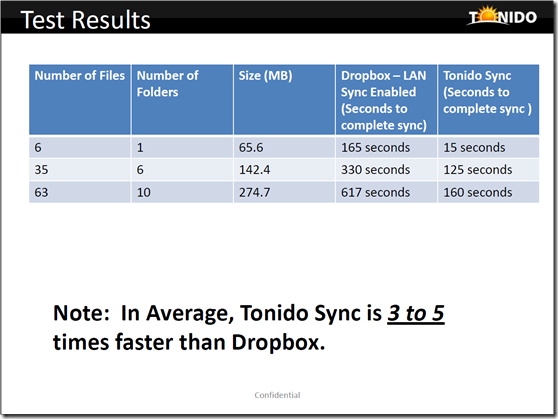 So we did a comparison study between Tonido Sync vs. Dropbox’ s two way file synchronization performance within LAN. When the Tonido server and sync client is on the same LAN network, our Smart LAN switch technology enables direct file, media sync instead of going through our relay servers. 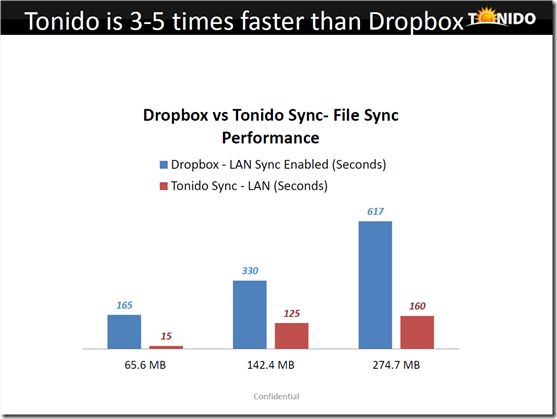 In similar fashion, Dropbox’s LAN Sync enables faster sync if two clients are on the same LAN. 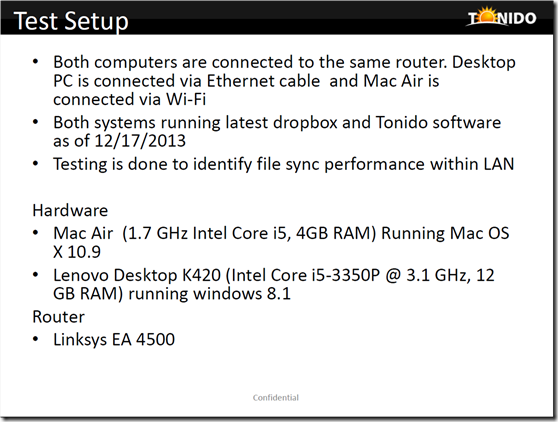 The benchmark results based on our tests will prove the merits of Tonido Personal Cloud in an objective fashion. Based on our user metrics over the years, we estimate 70-80% of access happens within home LAN and the remaining 30% of access happens over WAN. So it is very important to provide a superior experience when the access or sync happens within the home LAN and Tonido provides that superior experience. 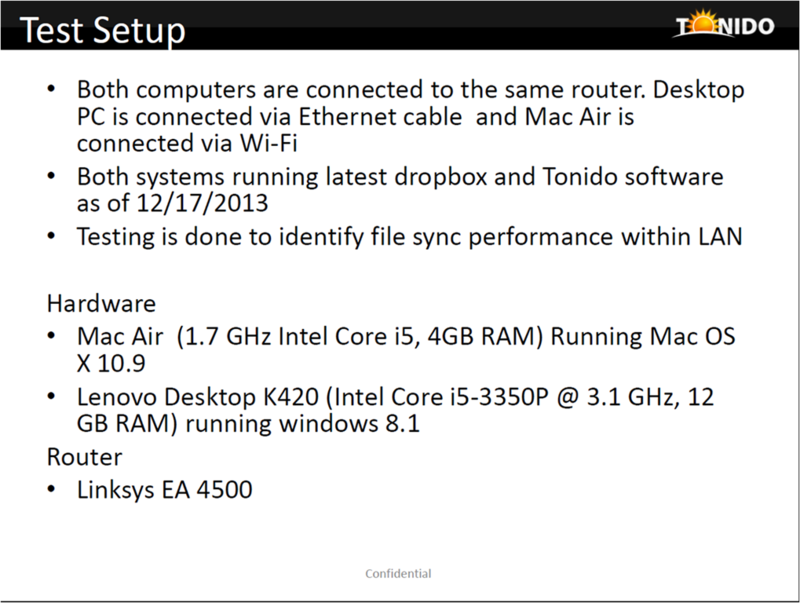 Both computers under test are situated in the same LAN, connected to the same router and ran the latest versions of Dropbox and Tonido software. 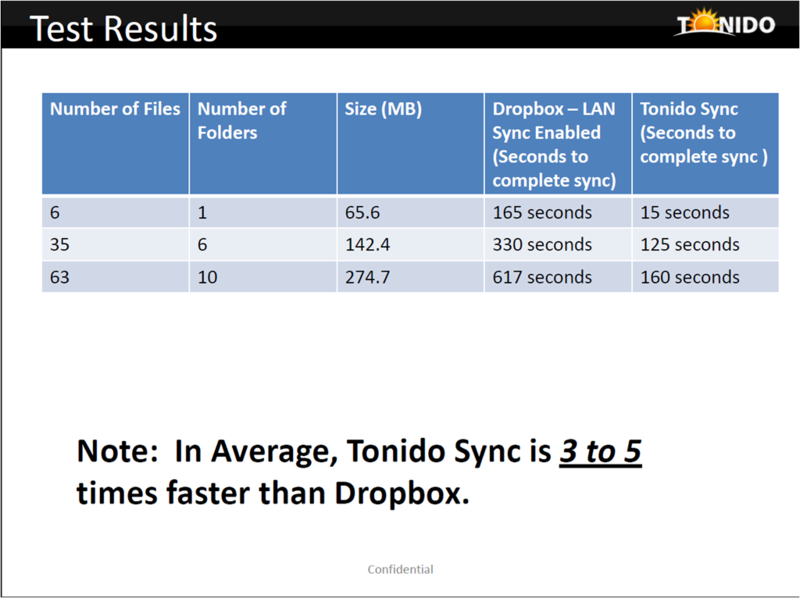 Based on our findings, In Average, Tonido Sync is 3 to 5 times faster than Dropbox in the same LAN. Let us know your experience in the comments. 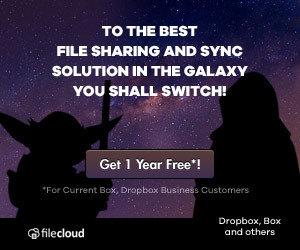 If you are looking a secure file sync software that is trusted by 1000s of enterprise users for file synchronization, then try FileCloud. FileCloud offers the best in class file and folder sync for small and large enterprises. Learn more! Virtual Private Networks (VPNs) allow businesses the ability to allow remote employees and vendors access into their private network when outside of its physical boundaries. Utilizing the Internet for leverage, VPNs connect a remote client into the private network as if they are physically connected to an internal switch. Once connected, the client workstation receives an internal private address and can access applications, file shares, and printers normally restricted to local access networks. Many different types of VPN connectivity solutions exist today that offer a range of features and security, but why would a business considering a VPN solution? VPN tunnels not only allow individual workstations to connect into the network, they can also allow entire remote locations to access the LAN. In doing so, a VPN connection between two sites essentially creates a WAN to allow two networks, in two separate physical locations, to communicate. For example, assume a small business is opening a new location across the street. The owners want the primary customer database server to stay at the original location, yet be accessible by its new location as well. One option would be to have a physical cable connection run across the street from one building to the next. This option is costly and could prove to be insecure or unreliable. A solution utilizing a VPN tunnel would be more cost effective, more secure, and more reliable. Each location would most likely already have a connection to the Internet. Utilizing a VPN connectivity device, such as a firewall or software solution, the two buildings can be connected via a VPN tunnel that communicated via these Internet connections. Doing so will create a logical connection between the two location, over the Internet, and allow devices within the two buildings to communicate as if they are physically connected. Imagine this same solution being used on a larger scale by nationwide or even global companies, and you can see how VPN tunnels allow large corporations to interlink their local connections together into a single private network. The physical workplace may be common to many workers today but the number of remote workers is growing. These employees are working from home (or any Internet enabled location) utilizing VPN connections into a central database. Instead of entire buildings being interconnected, these employees are connecting directly from a VPN client on their laptop or smartphone into the company’s private network. In doing so, the employee gains the benefit of working from home while still having access to every aspect of the network as if working inside the physical company building. In return, businesses are seeing a reduction in the cost of overhead. No longer must office space be purchased or leased to house workers during business hours. This also reduces their electrical, heating, and office supply bills. Similarly, VPNs allow companies to create a broader disaster recovery plan by deploying VPN client enabled laptops to their employees if a disaster occurs. Essentially, if a company experiences a disaster where a location offline or companies cannot report for a length of time, a VPN connection can be utilized to replace their physical reliance of the workplace. A VPN tunnel connection could also a lifesaver when vendor access is needed. If a vendor must be onsite to simply control or view the screen of a computer or server, a VPN tunnel could be utilized instead to allow the vendor to connect remotely. This could bring the company a quicker solution and save the cost of vendors traveling to an on-site location. VPN connections offer a secure method to companies who must connect remote locations or wish to reduce the overhead of a physical workplace. As the technology progresses and more benefits are found, VPN tunnels could become the primary method employees utilize to connect into a private WAN. Two primary technologies exist today to connect to a remote network utilizing: SSL and IPSEC. Both over a secure means to accessing internal networks remotely; however, they differ on how the connection is established. IPSEC establishes a secure connection utilizing software installed on the client PC. The client software establishes the connection to the remote VPN server. This authentication can be through Active Directory credentials or through a shared passphrase. Unlike the client-based IPSEC, SSL connection can be established through an Internet browser. This makes the VPN connection more manageable as a user does not need to install any software to connect. Utilizing the web- based client, a remote user can access the SSL VPN server device over any compatible browser. While email is great for sending and receiving small files, most of us have learned the hard way if you send anything over 2 MB in length you don’t know if it’s going to arrive at the other end. While some companies have increased the size of emails that can flow through their servers, you never know if it’s going to make it. To top it off, sometimes you don’t even get notification if the email failed to get delivered. Online file sharing makes handling large files easy. Anyone with a web browser (and proper access) can post and retrieve files securely. Collaboration improves with file updates that let everyone on the list know when a change is made. In addition, advanced features like version tracking make collaboration easy. File update notifications can tell people when a file needs to be reviewed. Using a private cloud solution allows you to maintain your own hardware and security. You have more flexibility with your customer data and critical enterprise files. Regulatory compliance is much easier, as some regulations will not allow a public cloud provider. Tonido filecloud easily meets these needs with a private cloud solution that gives you total control over your secure file sharing. Filecloud allows administrators to set up shares that are accessed securely by employees and customers alike. Sharing files is as easy as sending a link via email. Filecloud supports auditing so you no longer have to worry about who changed which files when. You can easily tell if a person has seen a file and made appropriate changes. Since you own the product, filecloud will allow your company to set up your own branding with custom logos and a domain. This can be great for establishing trust amongst employees and customers. Mobility has become a way of life for business today. Most employees need access to their files from phones or other mobile devices. Filecloud allows file access from anywhere using a mobile device for Apple, Android, and Windows. Tonido filecloud gives you a simple solution that is installed on your network. You control permissions in any users that have access to it. Once it is set up, employees can access the system from their computer or mobile devices from anywhere. Click on http://www.getfilecloud.com to find out more today. AUSTIN, Texas, Oct. 28, 2013 /PRNewswire/ — CodeLathe, the leader in personal cloud products and services, today launched Tonido FileCloud 4.0, adding new mobile device management (MDM) capabilities, file-change notifications, document preview and advanced administrative and configuration options to its on-premises file sharing and mobile access solution. 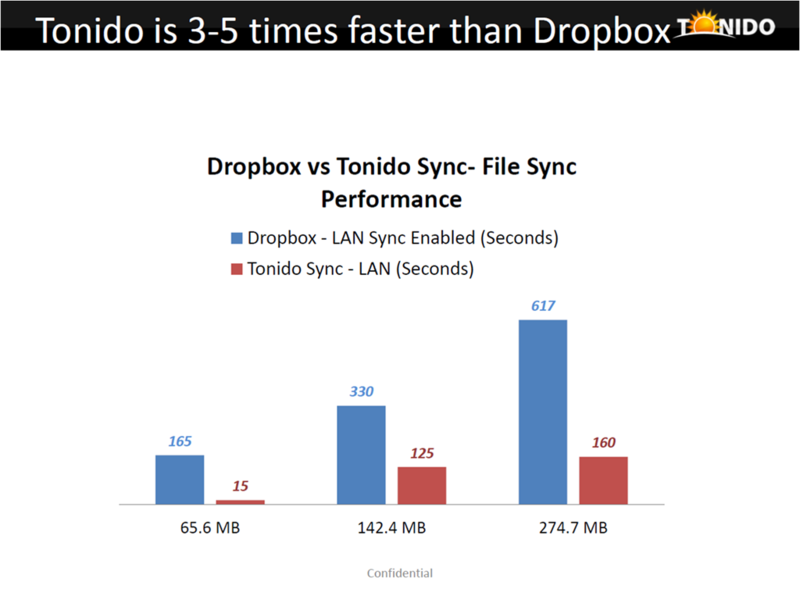 The only self-hosted enterprise-grade file sharing and sync solution, Tonido FileCloud puts businesses, schools, ISPs and MSPs in control of their data and infrastructure to ensure complete security and privacy, with the convenience, accessibility and real-time sync of web-based file storage. With this latest update, FileCloud 4.0 gives users even more control and customization options to address mobile device management. Mobile Device Management (MDM) that gives administrators real-time visibility into all mobile devices connected to FileCloud, to view data access activity and send push notifications to device owners. Using the FileCloud MDM dashboard, admins can also remotely wipe or block mobile devices to prevent unauthorized access to FileCloud if a device is lost or stolen. Smart Notifications that alert users in shared folders when files or folders are changed or edited, to keep everyone on the same page with real-time collaboration, consistency and versioning control. Built-in document preview that enables users to view common file formats, including Word, Excel, PowerPoint, PDF and .txt files, inside a web browser, without the need to download the full files and regardless of the software installed. This allows FileCloud users to share documents with other users running different operating systems and software without any conflict or compatibility issues. Enhanced administration tools that allow FileCloud admins to customize FileCloud templates, error messages and news feed options with point-and-click ease within the admin user interface dashboard, instead of requiring a configuration file. In addition, admins can see a real-time graphical snapshot of storage capacity, current usage and user activity, as well as add and configure access and security settings for users individually or by uploading a CSV file. Built-in file logging tracks all user-file interactions in a central log file for easy audit reporting. Tonido FileCloud offers the only secure, on-premises file storage and mobile access platform with truly cross-platform compatibility for all mobile devices, as well as any web browser and desktop drive sync. With built-in enterprise-grade security, Active Directory support for user authentication and petascale capability to serve even the largest organizations, FileCloud offers a complete file sharing solution in a single, simple, flexible and affordable solution. To get started with a free 30-day trial of FileCloud, visit www.getfilecloud.com. In many organizations, there will be a top level folder with folders for each employee/student/staff which is considered as that user’s Home Directory. Admins will want to make that Home Directory available automatically to users when they login via network shares. One way of accomplishing that is by creating a network share for each employee/student and mapping the folder path to that user. But this can get tedious and plain impossible when faced with a large number of users. To help this, FileCloud supports what is called as Smart Mounting. Smart mounts are network share paths with user variables, when assigned to a group will translate into different paths for different users of the group. 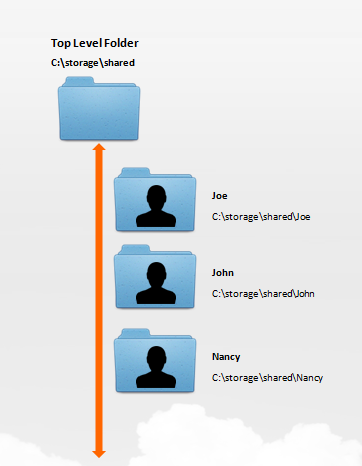 When Joe/John/Nancy users login into the system, you want to make their home folders available automatically. 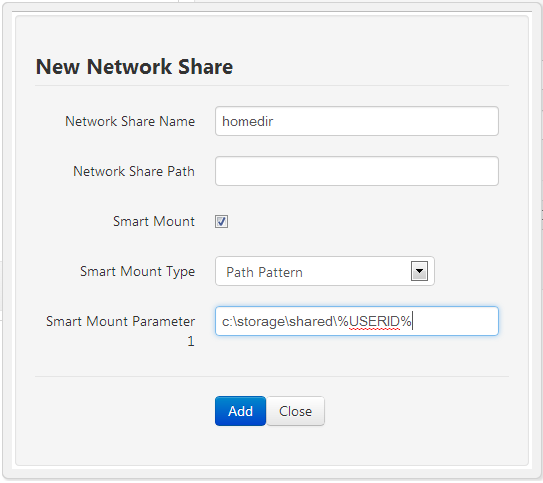 You don’t need to enter anything in Network Share Path, but select “Path Pattern” for the Smart Mount Type. (More options might be supported in the future), then enter a parameterized path like the following “c:\storage\shared\%USERID%”. This will replace %USERID% with the actual user account name when the user logs in. After adding the network share, make sure to add a Group (or Users ) to this share. Now members of that group when they login into FileCloud will see their folder automatically. If you want to assign this to all users in the system, simply assign it to the EVERYONE group. The EVERYONE group is a special group which has all the members in the filecloud system. If you don’t have a EVERYONE group, you can simply create a new group and use “EVERYONE” as the group name to create the dynamic group. Enterprise File Sharing (EFS) has come a long way from sharing mapped drives to sharing files via email with internal and external users. However, in recent days enterprises are demanding that EFS System to be an all-inclusive product that addresses a number of features such as security, mobile access, groups, network files, audit logs, emails, and integration with other enterprise products. FileCloud addresses all the above features and much more. 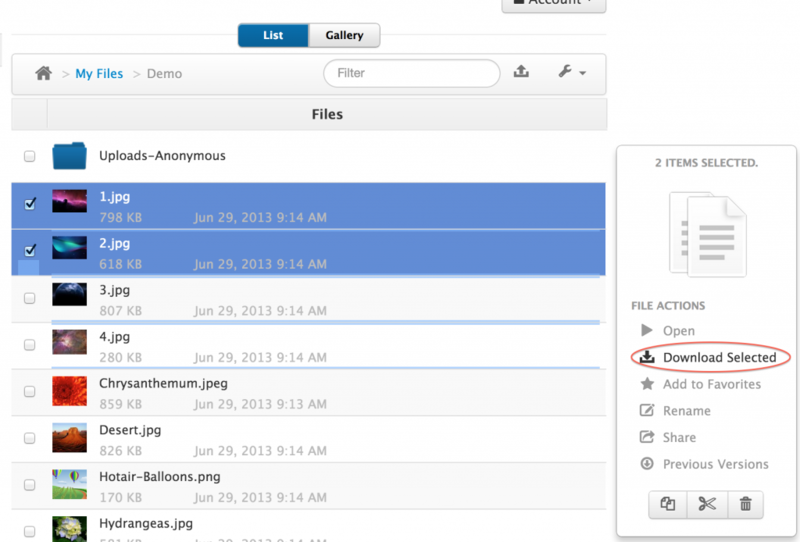 In this blog, I will discuss in detail the File Sharing features and capabilities of FileCloud. Upload, share and email all from FileCloud. File Sharing cannot get any simpler. Once the File or Folder is in FileCloud, you can simply create a share and even send an email from the FileCloud interface. By this process, FileCloud creates a public share which means that anyone can access the file through the File Share link. 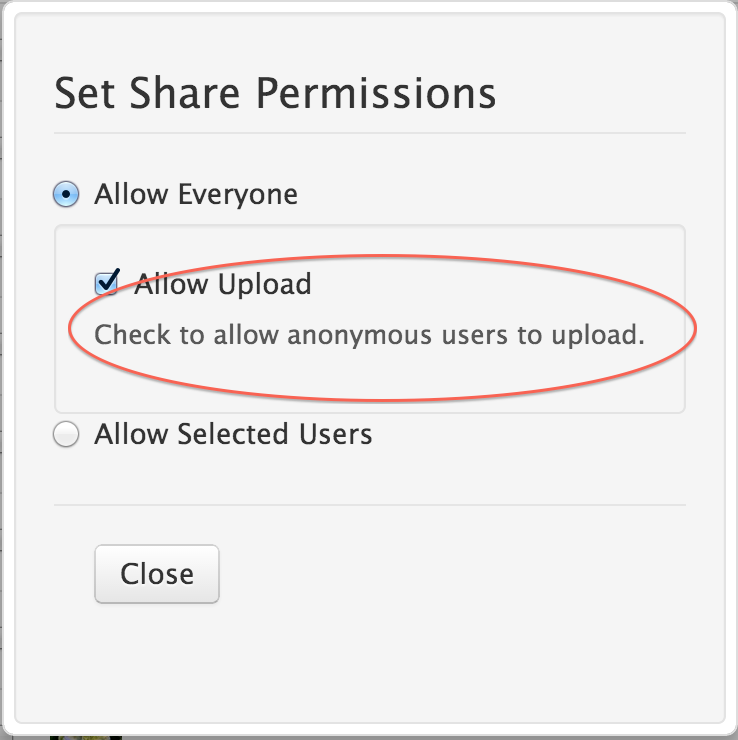 Additionally, when a public share is created, you can allow uploads to that public share folder. Once the share is created, you can choose to modify permissions and select an existing user or add a new user to share the file. By this process, FileCloud creates a private share. To access the shared file the user must have an active account and login into the FileCloud. Additionally, you can set permissions on your share to allow Read, Write (with upload size limit) and Share with an expiration date. 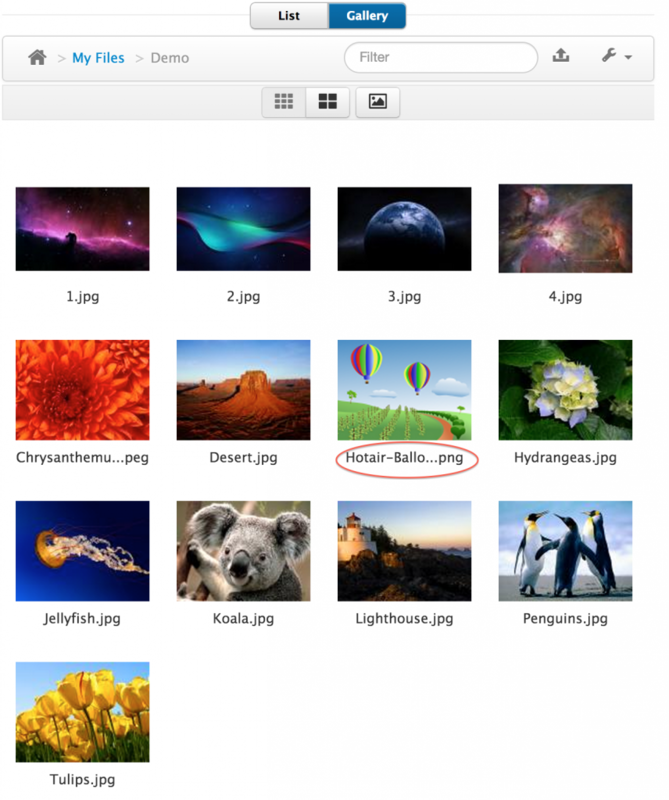 This feature allows users to upload file or delete a file from a share and also re-share the file or folder to other users. When you receive a file or folder as a public or private Share FileCloud allows you to re-share the file or folder to a different user. All the more, the ability to re-share can be set when the share is originally created. Admin can create a group and add a bunch of users to the group. 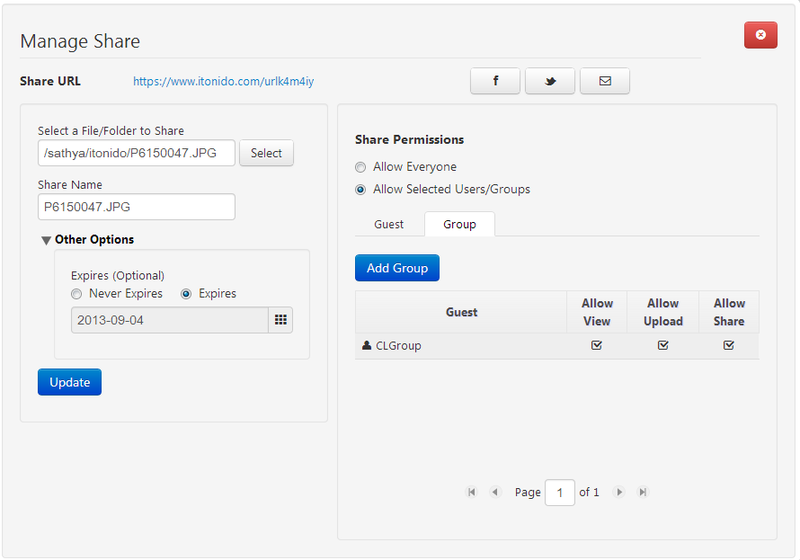 Users can share a file to the group as a private share. Any user in the group can log-in to view the shared file. Admin can create a network share from the FileCloud admin portal. Once a network share is created, the files and folders in the network shares are accessible in the FileCloud User Interface and users can create a share and set the permissions to AD users or local users added through FileCloud. FileCloud can be integrated with your existing AD and LDAP system. Thereby, all AD/LDAP users can immediately start using File Sharing features of FileCloud. 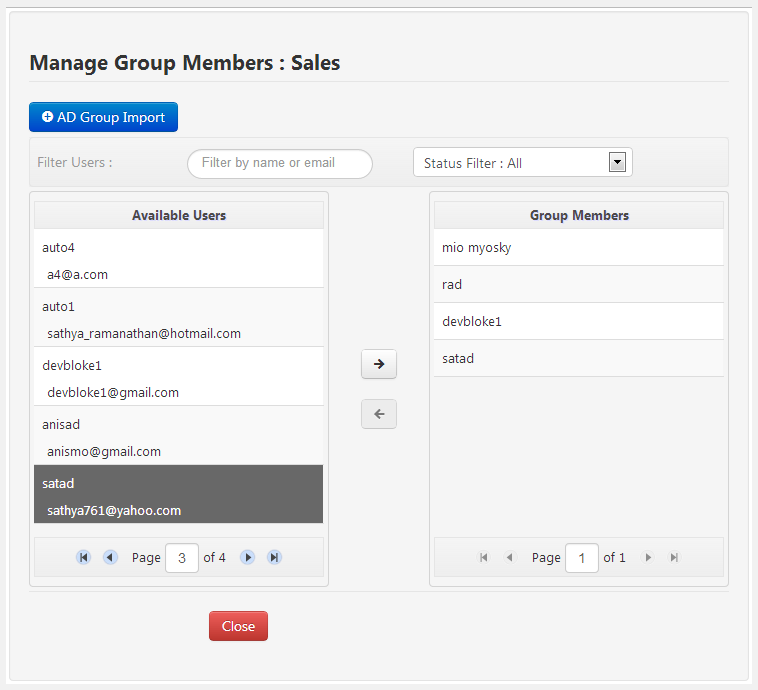 Additionally, admins can add an AD group and its users directly in the FileCloud admin portal. No File Sharing System is complete with support for BYOD (Bring Your Own Device). FileCloud supports a range of mobile systems from iPhone, iPad, android, android tablets, Windows Phone, Windows Tablet and Blackberry. Users can create a share and access a share through all these mobile devices. Logs are created when Shares are created and accessed. The log indicates who did what to what share when and how. You can view and export this audit log through the admin portal. Beta version of FileCloud MS Outlook add-in is available. Once installed, users can (a) Upload a file to FileCloud and share the file as a link or attachment through email (b) Share and email a file or folder that is already in FileCloud directly through outlook. In essence, users no longer have to worry about file size limits when emailing a file, save time and improve efficiency when sharing files. I hope you got a complete overview of all the features and capabilities of Enterprise File Sharing in FileCloud. With our recent release of version 3.0, we have addressed many other features. FileCloud is a secure file sharing software that is trusted by 1000s of organizations across 90 countries for enterprise file sharing. Click here to learn why FileCloud is the fastest growing Enterprise File Sharing and Sync (EFSS) solution! We are happy to announce the release of FileCloud version 3.0. This FileCloud release offers a stunning array of new features and addresses pretty much all the pain points of enterprise file sharing. Admin UI Redesign: The admin UI was given a major facelift that gives a better visual appeal. The admin UI is now in tune and aligned more along the lines of FileCloud Users’ interface elements such as menus, fonts and layouts etc. Upgrade support in admin UI: Now, updating your FileCloud is a breeze. Just click a button and you get the latest FileCloud updates. You can check for updates and update as needed. User Group Support for Network shares: In the older version of the FileCloud, administrators were able to share the file system to certain users. With the recent updates, administrators can classify users into groups and share the file system to the groups. No more pain of picking users every time to do a network share. AD Group Import: If you are integrating your Active Directory with FileCloud, you can now import a AD Group and its users directly into FileCloud. Multi-site management in a single machine install: The system supports multiple instances of FileCloud running under the same Apache server. This gives administrators the ability to spawn new instances with ease and reduce maintenance tasks. Downloadable audit logs in CSV format: We have added the ability to download the log files in CSV. And, import the file into Microsoft Excel and run all your fancy reports. Allow Mixed mode authentications In case you are using LDAP/Active Directory authentication, you are no longer limited by your Active Directory or LDAP Authentication. Now, the system will allow you to add users to FileCloud that are not part of your Active Directory or LDAP Authentication. Updated Statistics in Dashboard: Additional statistics such as Log Folder size, Groups, Network Shares, User Shares are included in the admin UI dashboard to reflect the new upgrades. Network Shares: Public and Private Sharing Support: If you are one of the users that has Network Shares, now you can share your network share as a public/private share. 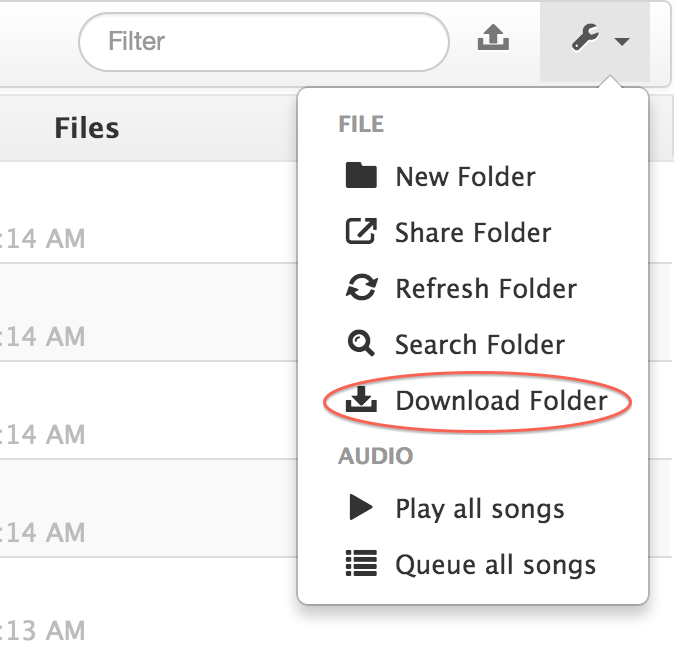 The feature will give your more usability and flexibility to share some files/folders on the file system. Anonymous file upload to public shares: When you create a public share, you have the ability to allow any user accessing your public share be able to upload files into the share. This feature will help you extend your public share feature. Support to Re-share a file or folder: We have added a feature to give the users that you have shared a file/folder to re-share. 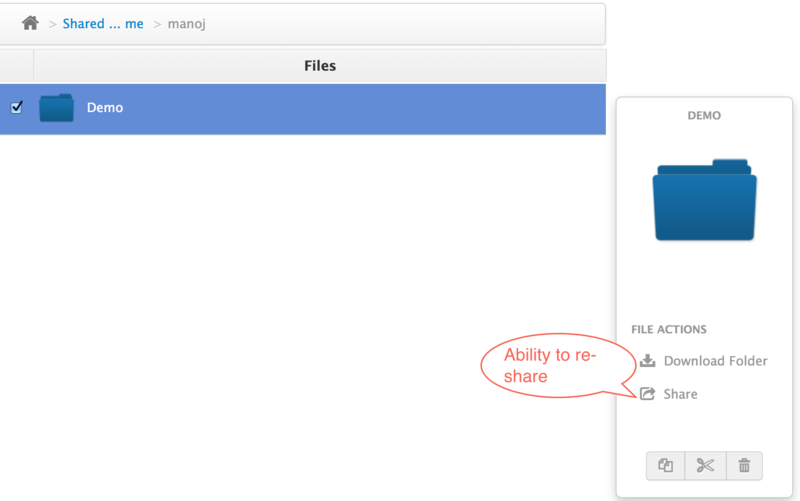 When you create a share, give the folder Read/Write access and check the Share Access. Now, the user you have shared your files/folders can re-share. When the user to whom you shared logs in, he/she will have the ability to re-share. Support to share a file or folder to a Group: If the admin has enabled groups, you can now share a file a folder to a group and all users within the group. You can even share to “everyone” if the admin has enabled the everyone group. Antivirus Integration Support: FileCloud now uses ClamAV an open source antivirus engine to detect viruses when files are uploaded into FileCloud. During uploads, if a virus threat is detected, the file is promptly removed and a note is made in the audit system for admin review. Directory download support: We have added support to download folders. The folder will be zipped and will be downloaded to the location you pick. Multiple file download support: You can not only download a folder in zip, but also download a bunch of selected files. The selected files will be zipped and downloaded to the location you pick. 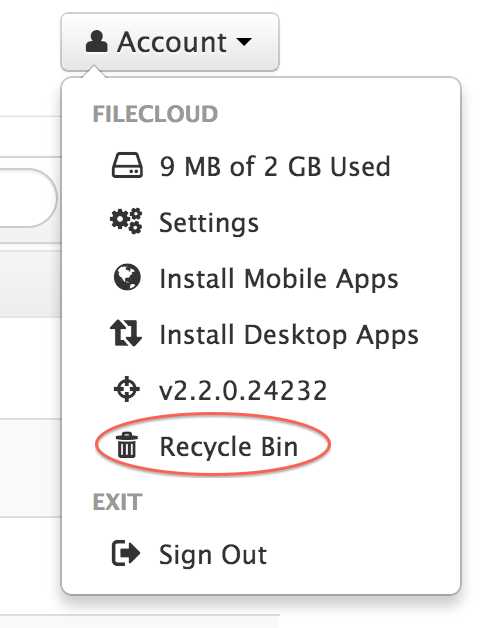 Recycle Bin support: Like any OS, we have added Recycle Bin support to FileCloud. When you delete a file/folder, we just move it to the Recycle Bin. In case, you need to recover, all you have to do is recover it from the Recycle Bin. To give Administrators more control, the Recycle Bin feature can be turned on/off. Support for PNG Images: We have added support to include PNG image format. More image support will be added in future releases. 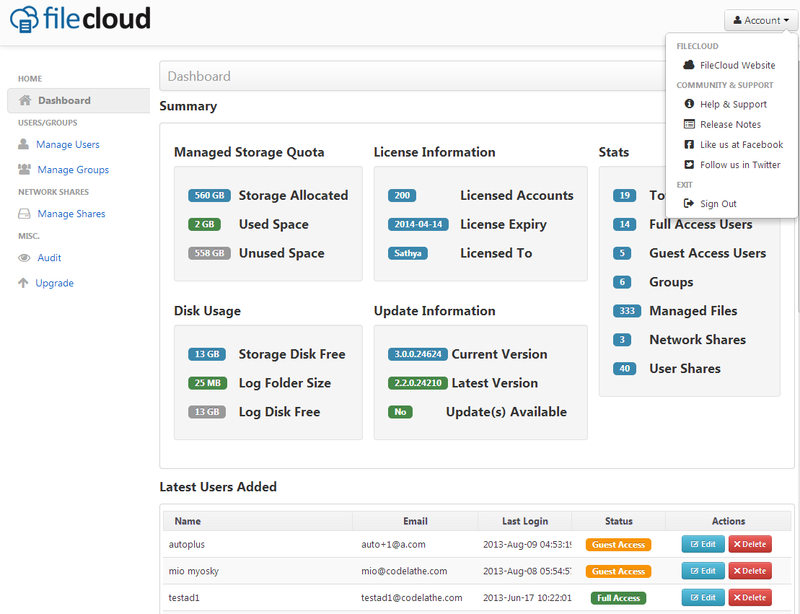 As you can see a major overhaul of FileCloud has been done that meets the important features requested by our users. You can always send us additional feature requests and enhancements that would improve the product and user experience and we will always be happy to accommodate your request depending on the feasibility. I recently read research study that was published by Gartner on February 2013 on Market Scope for Enterprise File Sharing and Sync (EFSS) solution. We wanted to see how FileCloud holds up in EFSS market space from a product perspective. In that study, Gartner identifies features and capability of an EFSS product and additionally, some of these product features are designated as mandatory or optional. Our analysis revealed that FileCloud meets all the mandatory features outlined in the study. Additionally, FileCloud meets and exceeds a number of optional features mentioned in the study. Click here to compare FileCloud vs. Gartner magic quadrant EFSS players and learn why FileCloud is the fastest growing EFSS! Mandatory or “must-have” features in an EFSS product as identified by the study. Additionally, FileCloud supports a number of optional features and capabilities for an EFSS product as identified by the Gartner study. FileCloud is a leading Enterprise File Sharing and Sync (EFSS) solution for Businesses, Enterprises, Universities/Schools, ISPs and Hosting Providers. Click here to learn why FileCloud is the fastest growing Enterprise File Sharing and Sync (EFSS) solution!